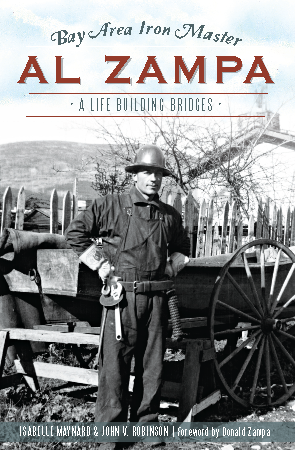 Alfred Zampa didn't know what he was getting into when he took a construction job in 1925 on the Carquinez Bridge, one of the first to cross San Francisco Bay. Despite the risk, Zampa relished the challenge and embarked on an illustrious career that made him a local legend. His impressive feats of iron craft are evident in numerous spans, including the Bay Bridge and Golden Gate, as well as others across the country. He was one of the first to survive a fall from the Golden Gate Bridge, making him a founding member of the Halfway to Hell Club in 1936. The Alfred Zampa Memorial Bridge, named to honor the man after his death, replaced the first bridge he had worked on nearly eighty years earlier. This remarkable story of skill, grit and enduring spirit is told through oral histories collected by John Robinson and Isabelle Maynard. Photographer and writer John V. Robinson is the author of six previous books including Spanning the Strait: Building the Alfred Memorial Bridge (2003) and Bridging the Tacoma Narrows (2007). With degrees from UC Berkeley and San Francisco State University, he was awarded a Guggenheim Fellow in Folklore and Popular Culture in 2006 and was a California Council for the Humanities recipient for documentary photography in 2007. Robinson teaches English at California State University, East Bay. Isabelle Maynard (1929–2007) was born in Tientsin, China and immigrated to California in 1948. An actor, writer, painter and oral historian, Maynard is best known for her book China Dreams: Growing up Jewish in Tientsin (U of Iowa Press, 1996). She also published dozens of short stories in literary magazines and is the author of the play The Ace: An Ironworker's Story of Heroism, Risk and Recognition on the Golden Gate Bridge produced in 1986.